Geico has released a new commercial, showcasing that, “if you want to save 15% or more on car insurance, you switch to Geico”. The 30-second spot, titled “Raccoons, C’mon Try It! 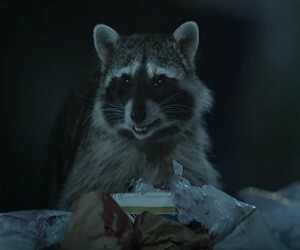 – It’s What You Do”, features three raccoons rummaging through garbage at night. When one of them comes across nasty leftovers and takes a bite into the gross remnants from a bin liner, he asks his friends to try it. Their conversation is quite funny, inspired by the human behavior. “Whoa, this is awful, try it!”, says the raccoon that found the gross remnants. “Oh, no, that looks gross. What is that?”, asks the raccoon near him. “You gotta try it. It’s terrible”, insists the first one. “I don’t want to try if it’s terrible”, answers the second one. “It’s like mango, chutney and burnt hair”, describes the first one the awful taste. “No, thank you, I have a very sensitive palate”. “Just try it!”, shouts the first one, losing his patience. At this point, the third raccoon intervenes, suggesting to hurry up. The first raccoon, showing no sign of hurry, says: “If you taste something bad, you want someone else to try it. It’s what you do”, adding that he can’t get the taste out of his mouth. The spot ends with the voiceover saying: “If you want to save 15% or more on car insurance, you switch to Geico. It’s what you do” and with the raccoons running away after hearing a dog.